It occasionally happens that a post or comment is flagged in error. Perhaps one's finger slipped and the wrong tiny icon was clicked. Perhaps the text was misread and a subsequent reading makes one wish that it hadn't been flagged. Or perhaps one has finally had some coffee and is better equipped to deal with the world. In any event, it sure would be nice to remove one's own flags out of the flag queue. Certainly on Stack Overflow there are just a ton of flags to deal with, and if I can remove one of my own myself I'd reduce that pile ever so slightly. I also really don't want to waste someone else's time when I know that the flag is going to be declined. I agree and I'd like to see this. I'm not quite sure why this post isn't receiving attention, because I'd think that, while I don't yet have enough rep to review flags, anything to reduce the massive pile of them would be appreciated. As @h2ooooooo pointed out, if a post is flagged for missing information, there's currently no way to unflag it if that information is added. Considering the fact that even I, as a relatively new user, have a few flags from months ago that are still active, being able to unflag them would make sense: I can't imagine how many active flags more experienced users have, although I guess the ability to close vote reduces flagging activity significantly. Also, this post has been used as reference for two three four (and counting) posts marked as duplicates, so I think it deserves a real answer. Was searching for a way to cancel a flag. Found this feature request. It turns out that the feature request has been implemented, as I just discovered to how to cancel a flag, when I went to flag the same post a second time (in order to ask that the first flag be ignored). If you flag the post a second time, the "I am flagging to..." dialog shows you which flag you had raised, and the Flag button changes to Retract Flag. If you click on the "Retract Flag" button, your previous flag is cancelled. Your profile's flags page also shows that the flag was self-removed. This is completed and live as of August 2016, see my answer on Meta SE for more details. Not the answer you're looking for? 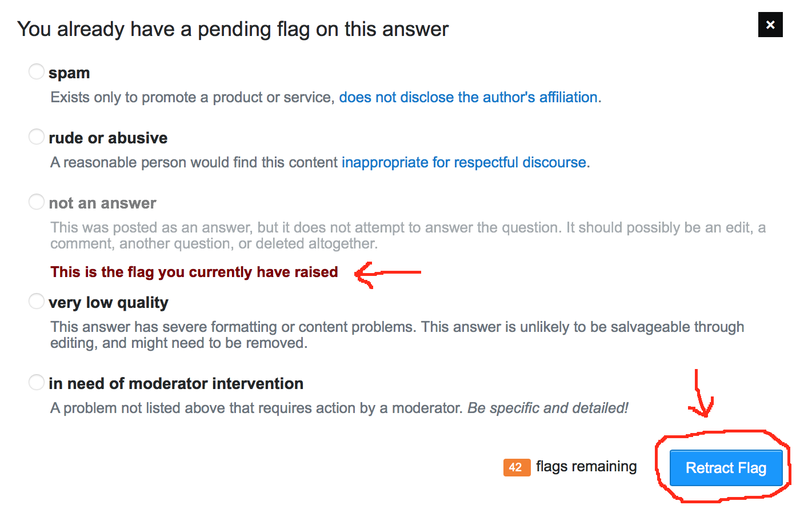 Browse other questions tagged feature-request status-completed flags retracted-flags . 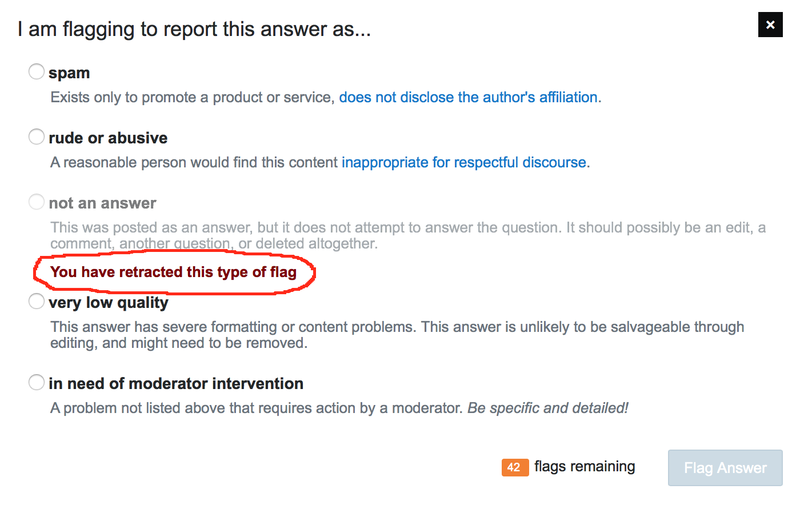 Can flags be retracted, and how in the Stack Exchange Android app? Accidental flag, what should I do? Is it possible to cancel raised flag by me? I flagged a question as duplicate. How can I reverse this decision? Can we have the facility to cancel flags that have been overtaken by events?